Almagor Terror Victims’ Organization sponsored a meeting of families of terror victims, the first such meeting since the Shalit deal. The Almagor Terror Victims’ Organization sponsored a meeting of families of terror victims at the Ramat Rachel Hotel in Jerusalem on Monday. The meeting was the first since the release in October of Gilad Shalit in exchange for 1,027 terrorists. 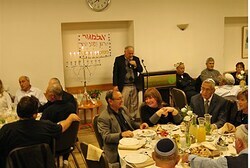 During the meeting, Almagor gave an award to Yossi Zur, Yossi Mendelevich and Ron Kehrmann. All three lost their children in a 2003 suicide bombing attack on a Haifa bus. The three men tried to prevent the release of the Shalit deal terrorists by filing a claim of compensation for damages in a civil court against the murderers of their children.